If you help raise puppies from birth until they are ready to go to new homes, you will have a tremendous impact on their character and behaviour as adults, and, hence, on their future lives. Following the guidelines on this page will help to ensure that the puppies you raise will be well adjusted and friendly in later life. Puppies need know how to relate well to humans. More than anything else, this determines their success as pets, show dogs or working dogs. How sociable a dog will be is determined by the experiences it has as a puppy, especially those it has before the age of 12 weeks. Sociable dogs rarely bite and are less likely to be returned to breeders because of aggression. As well as humans, puppies need to be able to interact readily with animals that they may encounter in later life, such as other dogs, cats and livestock (see later how to ensure protection against disease). Socialising with other dogs at an early age can make the difference between a good pet that can be let off the lead to play and one that has to be taken out in the dead of night when all others are asleep. It can also make the difference between a confident show dog that displays itself to the full and one that is worried by others and presents poorly. At the same time as socialisation is taking place, puppies also need to get used to the environments in which they are to live when they mature. They need to get used to things in the world that we take for granted. If this is done when the puppy is really young, it will be happy and confident in any new situations it may encounter later and much less prone to developing behaviour problems in later life. Puppies that have been well socialised will definitely make better pets, so you should be able to charge a premium rate for them. Explaining to new owners the work that has been done already and sending them away with the tools to make sure they can continue with this is something that new owners should value highly. 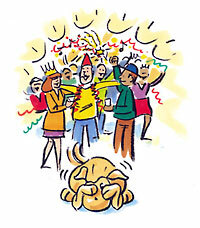 As soon as a puppy is old enough to move around, it will approach anything or anybody willingly and without fear. By the time it reaches about 12 weeks of age, anything new will be approached with caution and trepidation. Therefore, the critical time for meeting people and other animals, and getting familiar with things in the environment is between 3 and 12 weeks of age. Puppies usually go to new homes from the age of about 6-8 weeks. This means that about 3 to 5 weeks of the critical socialisation time is spent with the breeder. During this time, puppies should be exposed to a whole range of different encounters and experiences to equip them for life in the human world. As a puppy gets older and its brain develops, it gradually becomes more and more able to take in and retain information. Therefore, it is necessary to begin slowly at a very young age and gradually increase the amount of exposure as the puppy matures. Puppies need to be continually socialised and exposed to different environments up to the age of one year if they are to stay sociable. This is particularly important in the case of puppies that are kept in kennels and ‘run on’ to develop their show potential. By the time puppies are 7-8 weeks old and ready to go to new homes, they should be friendly and outgoing with people and other animals and readily accept any new situation they may find themselves in. In comparison, puppies that have been kept in kennels until this age will be shy, concerned about leaving the security of littermates and will actively avoid encounters with people and other animals. Outgoing puppies are more likely to develop a sound temperament and fit easily into new homes, whereas shy puppies readily develop unsociable tendencies making them less than perfect as pets or show dogs. The optimum period for socialisation is between 6 – 8 weeks and it is important that a lot of work is done with different people of all ages during this time. If this is not possible, it may be better to consider placing them in homes sooner rather than later where socialisation will occur more readily. 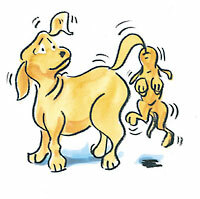 If the puppies’ mother is friendly and confident, have her present during socialisation. If she is nervous and unsure, it is best to socialise the puppies by themselves. It will be necessary to arrange for a number of different people of different appearance and ages to visit the litter from the age of 4 weeks onwards. As well as adults of all ages, it is important that puppies meet and have pleasant encounters with children of all ages; toddlers, school-age children and teenagers. It is not difficult to get families to play with puppies but you will need to make an effort to find them. An advertisement in your local veterinary surgery, perhaps, may bring in local people of all ages who will be happy to help. All visits will need to be supervised to ensure that the puppies have enjoyable experiences. The amount of time needed with people will vary according to age, but you should be aiming for a minimum of 30 minutes each per puppy per day by the time they are ready to go to new homes. Three or four sessions per day are better than one long one. Aim for someone to spend a few minutes per session with very young puppies, increasing it to at least 10 minutes as they get older. How many people will need to visit will depend upon how often they come and how long they stay for. Aim for at least one person other than those caring for the litter to see the puppies once a day from the age of 4 weeks onwards, each person visiting for at least two days. If a puppy gets to know about 10 people of all ages really well before they go to new homes, they should be happy in the company of most people later in life. When puppies have met many different types and ages of people in this way, they tend to generalise and react in a positive way to most people. 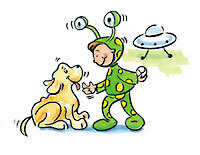 During each session, each puppy should be talked to, picked up, handled and played with individually. Soft collars of different colours can be put on during the session to help visitors distinguish between them. As the puppies get older, containing the ones not being worked with behind a barrier is useful as it allows for good quality one-to-one contact with each puppy. 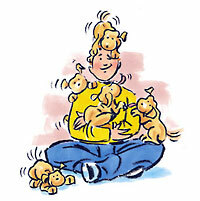 Visitors should be taught how to hold and lift puppies gently but securely so that they do not learn to struggle. Playing with toys should be a big part of the session. 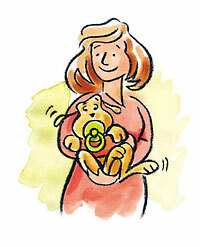 Use soft toys that can easily be carried by the puppy but which are too large to be swallowed. Teaching puppies how to play with humans at this early stage helps to avoid them learning to play-bite human hands. During each session, gently teach puppies to accept being handled all over. Gently examine ears, eyes, mouth and tails. They will also need to learn to cope with being restrained, holding on when the puppy struggles and letting it free when it relaxes, ensuring always that no discomfort is being caused. Once the puppies have got used to wearing a collar during these sessions, teach them to accept being restrained by it and, a few days later, to be held and walked on a lead (never use a check chain, only a soft buckle collar). Teaching them they cannot pull against the lead at this young age leaves a lasting impression that makes taking them for a walk much nicer in later life. Training puppies to ‘stand like a show dog’, ‘sit’ and ‘come’ when called with a ‘hands-off’ approach and titbits can begin as early as 6 weeks of age. Throughout early life, the puppies nails should be trimmed carefully and frequently by an experienced person so they learn accept this. You either have different animals around or you don’t. Bringing in animals from elsewhere is not always recommended unless you are certain of their temperament and health status. If you do not have other animals around, taking the puppies out individually to meet confident cats and livestock should happen regularly from about 5 weeks of age. If you do have other animals around, puppies can begin meeting them from 4 weeks of age. Always plan ahead to ensure that the puppies are protected from injury and fright during these encounters. If puppies meet and have pleasant encounters with different breeds and sizes of adult dog at a young age, it ensures they will be able to relate well to others in later life. Make sure that all the dogs they meet are healthy, vaccinated, have not recently been walked in areas where other dogs have toileted, and are known to be good with puppies. 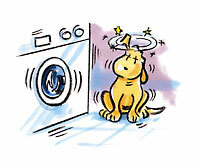 Such dogs are not always easy to find, but contact with them will really make a difference to future temperament. You should aim for the puppies to have at least one new experience per day. This can range from placing a novel object in with the puppies during the 3rd week, to taking them out for short car rides at 5 weeks of age. Choose experiences that are unlikely to overwhelm them at their stage of development, but try to stretch them a little every day. Gradually accustoming the puppies to different experiences will provide an opportunity for them to become familiar with a wide range of different scents, sights and sounds. Remember to imagine how it feels to be that small, vulnerable and inexperienced and try to make sure each puppy is enjoying the experience and not feeling overwhelmed. If the puppies live predominantly in kennels, they will need many different experiences each day to ensure they will cope well with a household environment when they go to new homes. If you are unable to let the puppies grow up in ahousehold, it would be very beneficial to bring them into the house during times when the family are cooking and eating. This is a time when there is much noise and movement and, even from behind a barrier, they will learn much that will help them adjust to family life in future. When they reach about 5 weeks of age, puppies can be taken on outings. Choose places where they will encounter different types of people, such as old people’s homes, school or veterinary surgery. Moving the whelping box to a different room or area about three times during the 7-8 week period will help to provide a chance of scene which will help them learn to deal with different environments. Since a dog’s primary sense is that of smell, part of the socialisation process involves getting used to different scents. This can be achieved by hanging pieces of cloth in different places, such as the veterinary surgery, a kitchen or wiping them on a baby, a man (if only women care for the puppies), cat or another dog. This may not seem very important to us as humans, but it can play a big role in the process of familiarising puppies with the world outside. All encounters and experiences should be enjoyable. If puppies become scared or anxious, it will set back progress. Try to plan ahead so that unpleasant events are avoided and arrange for all encounters to be successful and rewarding. Visitors will need to be supervised and everyone responsible for the pups will need to learn to read their body language so that they will know whether they are enjoying the experience or not. Never overwhelm puppies with too much at once, and always allow them plenty of time for sleep and rest between each encounter. Puppies will need to learn to cope with being isolated from others by the time they are old enough to go to new homes. Begin this process slowly, beginning with each puppy being separated for a few minutes but able to see and hear its siblings. Gradually increase the time it is left alone for until it can cope with about 10 minutes isolation by the time it is 6 weeks old. If a puppy becomes unduly distressed when left alone at any stage, reduce the time it is left for until it can cope and progress more slowly next time. After a period of isolation, give the puppy plenty of social contact with people rather than putting it straight back in with the litter as this will help to speed up the process of socialisation with humans. As soon as puppies are able to move away from the nest, it is important to give them easy access to a toilet area covered with a material different to that which they sleep on. This will ensure that their instinctive desire to be clean is encouraged. As the puppies mature, it is useful to begin the habit of taking them out onto grass to eliminate as soon as they have woken up or just after a feed or play session. Praise and titbits given for toileting outside will encourage this behaviour. Dogs from some breeds, such as Collies and German Shepherd Dogs, are more reactive and sensitive than others and they are likely to need more socialisation earlier than other breeds. They will also need very careful exposure to new experiences to ensure that they are not frightened or overwhelmed by too much too soon. Some puppies in the litter may also need more careful treatment than others, perhaps those that are smaller or more shy than their littermates. Taking care of individual puppies and making sure that each one is feeling comfortable with every situation will ensure that they all grow up to be well adjusted. Young animals are very susceptible to disease before their immune systems have had a chance to become effective. Very young puppies acquire some immunity from their mothers if she has been fully vaccinated which protects them during the early weeks. This fades over time and needs to be replaced by immunity stimulated by vaccinations. Some vaccines (e.g. Nobivac) allow the vaccination course to begin at the age of six weeks allowing earlier protection than was once possible. Since keeping puppies isolated until they have developed full immunity can ruin their future character, a compromise must be reached between the need to protect against disease, and the need to ensure good mental health. As most of the socialisation will be with humans rather than other dogs, such a compromise is feasible and, if the following guidelines are adhered to, it is possible to socialise your puppies and avoid the risk of infection. not be allowed to mix with dogs of unknown vaccination status. be taken out and about often in ‘non-doggy’ areas, carrying them if necessary to allow them to experience new sights and sounds without the risk of contact with disease. Young puppies are likely to have more intestinal roundworms than adults unless they have been adequately treated with medication. Human can become infected with the larval form of the worm. The larva develops in the egg about 10 days or more after the faeces have been passed. Ask your veterinary surgeon for an effective worming medication (e.g. Panacur) and pick up and dispose of faeces regularly. For hygiene reasons, try not to allow the puppies to lick the children’s faces, particularly their mouths, encourage children to wash their hands after playing with the puppies. Socialisation is not difficult but it does require a steadily increasing effort from the time puppies begin to move around to the time they go to new homes. For the stock that you decide to keep, maintaining the socialisation until the puppies are a year old will produce confident, sociable show or working dogs with excellent temperament. Such dogs will find it easier to cope later if the decision is made to place them in homes rather than keep them in kennels. Making the effort to socialise is always worthwhile, particularly if you have selected the parents for their temperament as well as their looks. For the dogs that go on to be pets, all that is left to do is to choose suitable new owners. Use the Sounds for Life CD (available from the Puppy School shop) every day to help the puppies develop a total lack of concern about sudden loud noises such as fireworks and thunder. What’s new in weeks 4-5? What’s new in week 5 onwards?